Why Choose the Dyslexia Specialist Program? 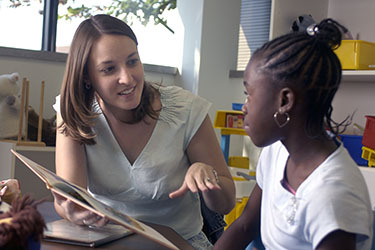 The program is a graduate certificate program offered by the College of Education and Human Services that leads to professional credentials and knowledge for individuals to serve as a dyslexia consultant and dyslexia intervention specialist for schools or organizations. The purpose of the Dyslexia Specialist certificate program is designed to meet the growing need for trained professionals to work with the high number of students diagnosed with dyslexia or who have dyslexia tendencies. The program is not just for educators, but also for parents and other professionals who want to learn more about dyslexia and how to support individual learning needs. Such candidates may enroll in the introductory courses without completing the certification program requirements. Satisfactory completion of the program gives candidates training in identifying the key characteristics of dyslexia, how the dyslexic brain process information, how to assess, diagnose and implement school-wide plans that support students with dyslexia, and how advocate on behalf of such individuals. The program can be completed in 3 to 4 semesters with as few as 14 credit hours. Candidates can take advantage of the many courses that are offered online that utilizes both synchronous and asynchronous learning platforms. There are many misconceptions of dyslexia leading to improper academic and social support. One main misconception is that dyslexia causes individuals to see words backwards. The individual visually sees stimuli the same as a typically developing individual but cognitively processes information through different neurological pathways, often resulting in the information being processed out of sequence. Understanding how an individual with dyslexia cognitively processes stimuli brings awareness to the possibility that it may not be ideal to label it as a disability but as a personal strength that thrives when nurtured properly. One out of five students in every classroom has dyslexia and often goes undiagnosed and untreated because of the lack of training provided in many professional preparation programs. The definition of dyslexia and evidence-based practices that lead to remediation have been established through research for many years but has not made it into all professional preparation programs to the necessary levels. Likewise, many of the already implemented reading interventions in schools are effective for individuals who are poor readers, but dyslexia is different than just being a poor reader. Therefore, such implemented reading interventions will not effectively support students with dyslexia. The evidence-based interventions that do support the students with dyslexia will effectively support all struggling readers. Thus, the program’s goal is to provide education professionals, as well as other community members, training on the defining characteristics of dyslexia and how to effectively support the individual’s learning and social needs that result from dyslexia. If you are interested in this program, please contact Jessica Kieta at ted5@wright.edu.